(Notes on) Politics, Theory & Photography: Mass delusion: the rise of Libertarian Views in the U.S.
Mass delusion: the rise of Libertarian Views in the U.S. It turns out that libertarian views have been increasing in the U.S. over the past decade or so. 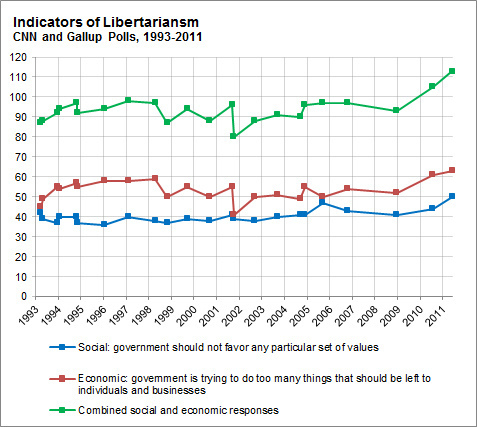 I have a reasonably dim view of libertarians and have occasionally made that clear here before. This trend in public opinion seems to me to reflect mass delusion - people who attribute whatever success they've had solely to their own hard work and genius and stand around, entitled to government relief in the face of natural disasters, old age and such things. Well, it looks like that those putting across alternative views have not been particularly competent at doing so. Your use of 'mass delusion' is interesting to me. It implies that someone, somewhere knows what the unchallengeable 'truth' might be and that those who don;t see it are deluded. Would a more realistic (and certainly more humble) narrative not be that none of us know which way should really be up and we just have opinions - each one of us deluded in our own little, merry way? My view is that history - actual history in, say, the US - suggests that the idea we can do without the state or that we have prospered by relying purely on "free market" institutions is delusional. Think interstate highways, the internet, the post office, to say nothing of contract enforcement and so forth. I'd be happy to read a plausible history that leaves out reference to those broad government initiatives. Libertarianism is false to history and theoretically insupportable too. Sure we can argue about the ways this or that program works or might, but that is different from saying that we need as close to a minimal state as we can get. Moreover, I think a lot of people who simply announce "less government" until their own pet programs - read medicare, social security, public schools - are not thinking when they make their general pronouncements. Does that mean I have all the answers? No. But it means that I have a pretty clear idea that others don't either. As for the ability of folks with other views to successfully and persuasively convey their views, I could not agree more. What we are getting from (Obama, say) is rudderless 'bi-partisanship'. I think the rise of libertarianism can, indeed, be described as mass delusion, but it's pretty nuts-and-bolts as to how we got to this point. Civics, history, and economics are, by and large, taught horribly in the public schools, in ways that tend to make students' eyes glaze over--to some extent, I think this is, in the end, by design, but whatever the causes, there is no doubt that the schools just don't educate the population on these topics. So combine a largely ignorant mass of Americans with a mass media that always, always, always favors the propertied class, in both entertainment and news programming, and the bogus tenets of libertarianism don't appear to look half bad. You know, "no such thing as a free lunch" and all that stuff seem reasonable if you don't think about it too much, so it doesn't surprise me that so many people are into it. The GOP Candidates Debate ~ Where is Snow White?